1BR + Murphy bed / 2 Bad condo (max. 6-7) in Red Hawk Lodge. Gelegen in River Run Village (skigebied Keystone). Heel dicht bij de nieuwe River Run-gondel. Loop naar alle winkels, restaurants en activiteiten in het dorp. Veel voorzieningen op het terrein: een verwarmd buitenzwembad, 2 bubbelbaden, een barbecue, een speelkamer (pooltafel), een veelzijdige lobby met een stenen open haard en een tv-lounge met een groot scherm, een oefenfaciliteit (met twee ramen met uitzicht op de skipistes), stoom kamer en gratis ondergrondse parkeergarage. Loved our ski trip. Great location, walking distance to gondola. The kitchen is well equipped and was wonderful. Everyone's preferences on beds is different but we thought the mattress was too soft for our liking. The garage is heated and wonderful. 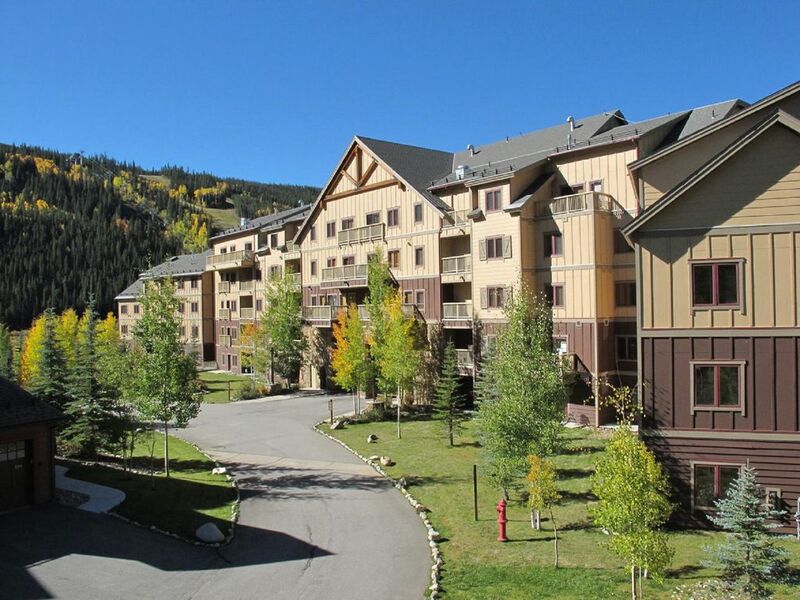 This condo very close to stairs and convenient to walk down to lobby, ski lockers, restaurants, etc. Bathrooms were clean and very well stocked with towels, kleenex, shampoo, soap, etc. Nice fireplace with switch control to turn on and off, very handy. Lots of restaurants close by in the village, but far enough away to be quiet. Loved the hot tub and sauna. The condo was new and nicely decorated, and all three beds including the sofa sleeper and Murphy bed had comfortable mattresses. Space was a bit tight for a family of 6 and all of our ski gear, but it made for a cozy stay. Ended up using the Murphy bed in the evenings along with the living room furniture as an extra spot to lounge and watch TV. The kitchen had everything we needed for meal prep, but we had to wash dishes after each meal as there were just enough plates and bowls for our family. Not a big deal, but a few more could be added. The best part of the condo...the short walk to the ski lifts! No buses to ride or parking to deal with, and we were able to meet at the condo for lunch to warm up and relax. Parking in the heated garage below was convenient, the hot tubs and pool were great, and we even used the game room to play some foosball and checkers. Overall, we enjoyed the stay and would definitely come back again. Great place to stay. Easy access and has all the amenities that you need. Really close to the River Run Gondola which was one of the reasons why we picked this place. Jenifer S.Where do you live? Condo is in great location and easy to access our room because it is on second floor right beside the stairs so we walked in and out very easy. The condo was nice size for us. Our kids are 15 and 18 so both had a bed to themselves. My only disappointment was our bed... I would have given 5 stars, but they really need a new mattress in the bedroom and a larger bed. If you are used to a smaller bed you’ll be fine, I’m used to a king. I chose this room so kids could have their own space. The two bathrooms were awesome! Nice flatscreens and fireplace. We would stay here again. Because of the room configuration where the bed fits, there is not enough space for a King bed. But we did listen to this guest's request and installed a premium quality Queen mattress and box springs in February, 2019. Kitchen fully equipped, super short walk to gondola, immaculate condo. Gorgeous views from pool and hot tubs. Updated appliances, bathrooms, nice furniture. Nice little unit. I think more than four adults would be tough for anyone our age. :) The building layout was confusing the first day -- some floors don't continue from end to end, making the elevator ride tricky the first day. We were really happy with our 3 night stay in late March. A 5 minute walk across the parking lot and you're standing at the bottom of River Run Gondola in Keystone. Another 5 minute walk and you are right in the center of River Run Village which is full of children's activities, shops, and restaurants. The condo was worth every dollar. A nice lobby with games and toys for the kids, a heated pool and 2 hot tubs which we used every day, gorgeous mountain views and a perfect location. The room was clean and beds were comfy. Plenty of space (we had 2 adults and 3 children), dishes, towels, and all the necessities were provided. Underground parking was very convenient. We absolutely will stay here again. MINIMUM STAY REQUIREMENT *** In general we have a 6 night minimum stay during busy dates, but there often are EXCEPTIONS where we’ll take even a 2 night stay for short GAPS between longer bookings and during less busy months. It’s best to just E-MAIL us to see if we have a gap yet that fits your requested dates. This works better CLOSER to the arrival date when we have more long bookings in place.